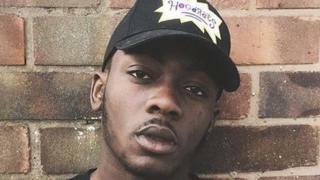 A man has been charged in connection with the death of the 21-year-old grandson of The Specials singer Neville Staple. Fidel Glasgow, the son of Mr Staple's daughter Melanie, died in a stabbing in Coventry on Saturday. West Midlands Police charged Atikou Diallo, 23, of no fixed abode with violent disorder, grievous bodily harm and possession of cocaine. He is due to appear at Birmingham Magistrates Court on Tuesday. A second man, 23, who has not been named, remains in hospital in serious but stable condition following the disorder. Det Insp Harry Harrison said: "Although an individual has been charged in connection with what happened on Saturday, we're working round the clock to identify and apprehend Fidel's killer." The Neville Staple Band played at Coventry's Godiva Festival on Sunday, dedicating a song to Mr Glasgow and sending a message about knife crime.